Sanders said the demand to conform to Chinese political correctness on websites and promotional material was aimed at coercing companies to abide by Communist Party of China standards. "This is Orwellian nonsense and part of a growing trend by the Chinese Communist Party to impose its political views on American citizens and private companies," she said. "China’s internal internet repression is world-famous," the statement said. "China’s efforts to export its censorship and political correctness to Americans and the rest of the free world will be resisted." The United States respects the broad freedom that private companies have in conducting interactions with customers both in the Untied States and abroad. "This respect is essential for a robust global marketplace," she said. The rhetorical pushback is the first time in decades the U.S. government has spoken out against aggressive Chinese propaganda and influence operations outlined in a Pentagon report several years ago as China's "three warfares." The Pentagon report said China's use of legal warfare, psychological warfare and media warfare were tantamount to non-kinetic information warfare designed to achieve strategic means without direct military action. The unusual White House statement reflects the tougher policies toward China outlined in a new White House National Security Strategy made public in December year, and a new Pentagon National Defense Strategy. The White House elevated the threat posed by China and Russia over the dangers of Islamic terrorism. The Pentagon strategy said China is using its military buildup, influence operations and predatory economic practices to coerce nations into accepting Beijing's regional hegemony. Beijing's propaganda warfare against Taiwan, Hong Kong, and Macao is aimed at tightening control over all three areas, analysts say. "China seeks to win without fighting, so the real danger is not that America will find itself in a war with China, but that America will find itself the loser without a shot being fired," said Jake Bebber, a Navy officer, in a recent report for the Center for International Maritime Security. Peter Mattis, an expert on Chinese influence operations, said the attempted coercion of airlines is part of China's bid to use lawfare to advance Chinese interests. "This is yet another example of [Chinese President] Xi Jinping's party locking in the PRCs national/state security through law," said Mattis, referring to the People's Republic of China. The White House statement opposing the effort was "elegant and forceful" in seeking to counter Beijing's pressure on foreign companies, and also an attempt by the party to frame all issues about China according to Beijing's policies, said Mattis, a research fellow in China studies at the Victims of Communism Memorial Foundation. "Such pushback should be welcomed, but the administration's effectiveness will be limited unless it takes measures in unrelated areas," he added. In Beijing, Chinese Foreign Ministry spokesman Geng Shuang said in response to Sanders' statement that "we have seen relevant reports." "Whatever the U.S. said will never change the objective fact that there is only one China in the world and the Hong Kong, Macao, and Taiwan regions are an inalienable part of China's territory," Geng said. The spokesman added that foreign companies operating in China "should respect China's sovereignty and territorial integrity, abide by China's law, and respect the national sentiment of the Chinese people." The Chinese government regards Taiwan, an independent state called the Republic of China, as a renegade province. The democratic-ruled island has one of the most vibrant economies in Asia and China is seeking to ultimately retake Taiwan from the remnants of Chinese nationalist forces that fled there in the late 1940s during a civil war with the communists. Beijing also is seeking to tighten its grip over the former British colony of Hong Kong and the former Portuguese colony of Macao. Hong Kong reverted to Chinese rule in 1997 and China has slowly squeezed its democratic system while maintaining its dollar-based economic system. China's government has accused the CIA of fomenting pro-democracy unrest in Hong Kong. Macao, a major gambling casino and luxury hotel center located 40 miles from Hong Kong, came under Chinese rule in 1999. Macao has been used as a recreational area for communist leaders and their families and also is known as a major money-laundering hub. 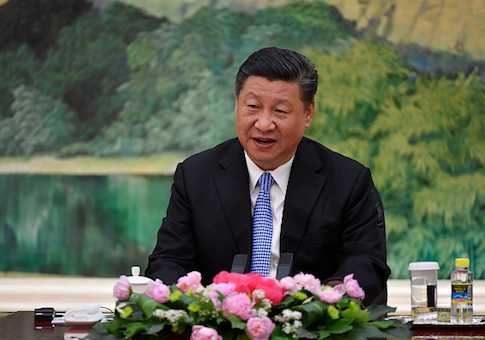 Under Xi, the Chinese supreme leader, China's government has been gradually increasing its control over all three states to submit to Beijing's dictates. The 1979 Taiwan Relations Act, however, authorizes the United States to provide defensive arms to Taiwan and to prevent the forcible reunification with the mainland. Both United Airlines and American Airlines have acknowledged receiving demand letters from China over what Beijing regards as politically incorrect lexicon related to Taiwan. The American hotel company Marriott apologized to China after the company's website was blocked in China for weeks after including both Taiwan and Tibet in a pull-down website menu listing them as countries and not Chinese regions. One of the Chinese letters obtained by the Washington Free Beacon states the Chinese aviation authority notified United Airlines that on Feb. 27 authorities notified foreign airlines they must conduct a "self-examination" of websites, apps, and other publicity channels for references to Hong Kong, Macao and Taiwan that "mistakenly describe them as countries or anything otherwise inconsistent with Chinese law." The Chinese then stated that the airlines "take measures to correct these errors." "After investigation, our organization discovered that on your company's official website, there still exists violations of Chinese laws and contradictions to the one-China policy of your government," the Chinese letter stated. The Chinese insisted United should not list Hong Kong, Macao, or Taiwan under "country" or "home country" tabs and should not list Taiwan as "equal to/in parallel to China." Second, the Chinese demanded that United's website map of Asia should include Taiwan as part of China, along with the same color for Hong Kong and Macao. Also, China demanded that United's website not include Taiwan and mainland China "in parallel" when specifying airline destinations. "If there is a need to distinguish between regions, you can refer to it as ‘China destinations' or ‘Chinese Taiwan (province/region) destinations,'" the letter says. China also demanded that United not classify Taiwan as a Southeast Asia destination, but part of a China destination. "We now request that your company, in accordance with the above requirements, complete the changes and submit the rectification report within 30 days from the date of this letter," the missive said. "If it not corrected within this period, our bureau will take further measures according to regulations, including on the basis of Article 8, Section 11 of the ‘Civil Aviation Industry Credit Management Measures (Trial Measures),' and make a record of your company's serious dishonesty and take disciplinary actions against your company in accordance with Chapter 3 of the Measures." The agency also threatened to report the violation to the National Cyber Information Office and other law enforcement agencies "to take administrative penalties according to law." The White House comments on Chinese attempts to impose political correctness on the United States comes amid growing tensions with China over trade and military issues. Trump has announced plans to impose tariffs on China for unfair trade practices and is preparing to restrict Chinese investments in the United States that could undermine American technology advantages. The Pentagon last week revealed that China fired lasers against aircrews aboard military aircraft that were flying near Djibouti, where China has set up its first overseas military base. Two aircrew members were injured and the Pentagon protested the actions as a serious risk to pilots. The Pentagon also is pushing back against China's militarization of disputed islands in the South China Sea. Chinese intelligence and military hackers also have been indicted for conducting cyber attacks aimed at stealing data from U.S. government and private sector networks.